Yolanda Adams performing at the White House in February 2007. 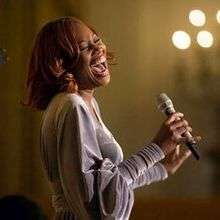 Yolanda Adams is American gospel music singer and radio show host. In total, Adams has won four Grammy Awards, four of the Gospel Music Association's Dove Awards, one American Music Award, seven NAACP Image Awards, one Soul Train Music Award and four BET Awards. Dove Awards Traditional Gospel Song of the Year "Is Your All on the Altar"
2001 NAACP Image Awards Outstanding Song "Open My Heart"
Soul Train Music Award Best R&B Soul Single, Female "Open My Heart"